I’m slowly transitioning out of election mode and back into geoscience mode. To help this transition, this post combines both! The map below (from this NY Times page) shows the counties that voted more Republican (in shades of red) and the counties that voted more Democratic (in shades of blue) as compared to 2004. There is a very distinct belt of deep red extending from the Appalachians to the Ouachitas in Arkansas and Oklahoma. 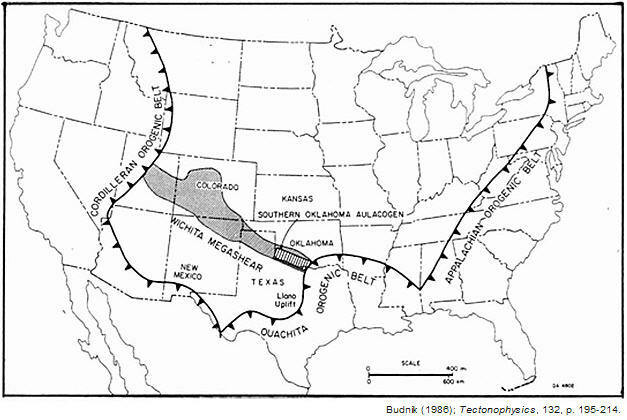 Now compare that belt of red to the map below that shows the Appalachian-Ouachita orogenic belt, which reflects the suturing of Gondwana and Laurasia to form Pangea in the mid to late Paleozoic. Okay, I guess the western Cordilleran belt doesn’t match anything … whatever … I wrote this post in about 2 minutes! Geology-rich posts are in the works … stay tuned. UPDATE (11/16/2008): Along the lines of the some of the comments below, I came across this composite map (from the Strange Maps blog) showing the counties that voted for Obama vs. McCain (blue and red colors, respectively) with the dots represent where cotton was produced in 1860 (each dot representing 2,000 bales). When I saw that electoral map, I also immediately thought “hey, that’s the Appalachian-Ouachita belt!” It’s interesting that the Alleghenian-Ouachita orogeny is red, but the Taconian part of the Appalachians is more blue. I was thinking it was geomagnetic effect of the New Madrid fault area. So why was I feeling so happy on Wednesday morning? Interesting post! 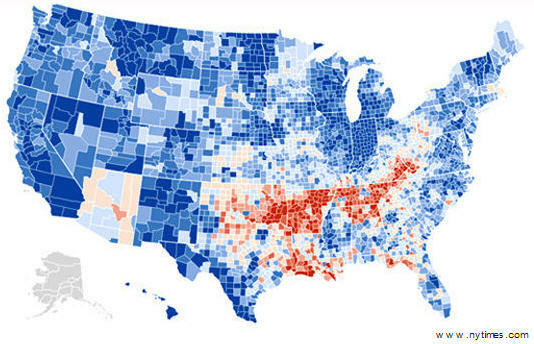 Arkansas, where I grew up, really stands out, doesn’t it? The reasons are complex, but racism plays a big role–at the end of the Civil War, former slaves outnumbered whites in much of the coastal plain and Mississippi floodplain in the southern and eastern parts of the state. Zoom in on Arkansas and Mississippi at the NY Times map to see the blue floodplain counties. To this day, the lower delta is very black and mountainous northwest Arkansas very, very white. And poor. Racial tension is still sadly high, and there’s a lot of geographic self-segregation. So geology/geomorphology DO affect the red/blue division, but mainly, I think, because of how they influenced agriculture and slavery. Steve … wow, I hadn’t noticed the floodplain relationship … very interesting. Can geologists in the “San Diego Corner” explore other areas (Arizona) outside their little domain…?! The batholiths around here are too young. I’d like to get across the River and experience Precambrian rocks for a change. At least I got to know Bill Rehrig, Bob Wilson and some others in my career!